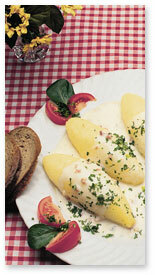 Saarland’s signature dish is an oven-baked potato-leek hash. Saarland’s version of crispy potato pancakes.. These dumplings are called “hairy” because of their rough outer texture, and are sometimes stuffed with a ground meat mixture. A traditional sauce for potato dumplings such as Hoorische or Gefillde. A bacon, onion, and potato soup.